We modern folk are quite fond of looking back smugly on the people of the past and labeling them as ignorant, bigoted and prudish. In many cases this might be justified, but sometimes, when you take a hard look, you can see what they were talking about. Almost every discussion of the history of the Waltz begins with a bemused mention that people once found it scandalous and shocking. Ha ha, what silly folk they were. Where ne'er before --- but --- pray "put out the light." "My slippery steps are safest in the dark!" The Waltz we know today was not the Waltz of the Empire/Regency era. It was not the fast moving, twirling Viennese Waltz of the Victorians, and it was not the sedate but graceful box-step of the 20th Century. It was a strikingly intimate and sensuous dance, which is a major departure from the group dances and stately minuets of earlier generations. To a society that focused so much attention on harnessing teen age libido to the purpose of making a good marriage, this was rather disturbing. 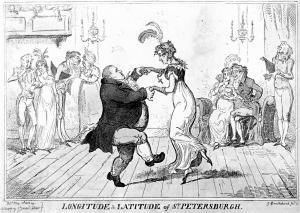 To see where the objection might lie, let's look at what the Regency era Waltz was. Mr. Wilson describes it as a medley, with three different but related dances in succession. They were danced as discrete and self contained dances. I am informed by my friend Susan De Guardiola that Mr. Wilson's is the only source she has found which specifies such a medley. It began with the "March" which was a very brief side by side promenade. This turned quickly into the "Pirouette" or "Slow Waltz". The partners would take each other in one of several holds, one of the more popular of which had the partners facing in opposite directions, hip next to hip, with one arm across the front of the partner's body and the other hands holding in an arch above the body. In this posture, they would rotate very slowly, with their gaze fixed on one another. This was the part that probably made the blue stockings the most nervous. The next was the "Sauteuse". At this point, the dance got a bit more energetic, with the music tempo increasing and the dancers working a little hop into the step. The posture would be changed - one possible option would be the man holding both the lady's hands behind her back. The routine would finish with the "Jetté" which was even more energetic and up tempo. In the hopping steps, the mutual gaze might slip a little, but they would return to it if they resumed the pirouette. The man would not be distracted from giving his partner his full attention by the need to maneuver in traffic. There was no maneuvering, and the only floorcraft required was keeping one's place in the circle--not stopping and not overtaking the people in front of you. The movement, in line of direction, would be slow, stately and constant. I can imagine that the most striking thing about this, and the most disturbing, would be its intimacy. In a country dance, there is plenty of eye and body contact, but it is fleeting and moves quickly from one person to another. In the Waltz, the eye contact is continuous and unflinching and so is the body contact -- with hands, as Byron describes, resting on any number of body areas, and lingering there for a while. One usually assumes that the march of time brings a steady movement away from prudery and towards a general loosening of society's strictures. The opposite seems to have happened to the Waltz. Within two decades of its arrival on the scene, it was evolving into the task oriented kinetic Viennese Waltz that required the man to turn his focus away from his partner's eyes, and pay attention to managing traffic and planning his next move. The Waltz had become more demanding and less threatening. Ah, yes, I recall vividly our thrashings around, attempting to learn "Congress of Vienna" when James and I were first dating. That intimate eye contact reduced us to giggles on many occasions, especially when we could not find our way out of the pretzel positions. Which I mention to agree with your point, Walter, that these dance moves have an impact even on us callow moderns. The Congress of Vienna is not the Regency Waltz. It is a modern construct, and a hybrid of Victorian and Regency elements. I have nothing against the C & V, but I just want to make it clear that the Regency Waltz was even more intimate and intense, and perhaps even more likely to reduce modern dancers to giggles. Agreed! It does capture some of the elements you mention, and people do have it as a point of reference. From the illustrations and your descriptions, I'm beginning to suspect that this is an ancestor of the tango. There is much in common between the Regency Waltz and the Tango--though the Tango, like other ballroom dances, tends to be more task oriented. 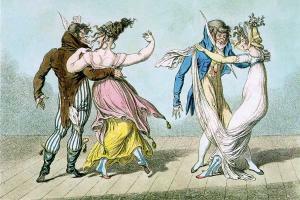 The Regency Waltz was very undemanding of the dancers' skills, and there was very little to distract from the staring and groping. 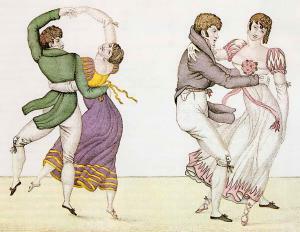 A quick note on "pretzel positions" such as you find in the Congress of Vienna: it looks like, with the Waltz, the movement from one posture to another, if it might have been at all complicated, would begin with the partners facing and holding hands (see position 3 in the small B&W illustration above). From this neutral position, it would be easy to move into any posture. Again, my sense of the Regency Waltz is that is was that it was designed to tax the dancers' skills as little as possible. I also get the sense that the Waltz and its postures, like swing dancing and other youth dance crazes, was being invented on the dance floor by the dancers, with a lot of "Hey, let's try this". The dance masters were bringing up the rear, documenting the practices that seemed, to them, to be fit for publication. Probably Wilson's 1816 London dance manual cleaned it up quite a bit from the "shameful" Vienna waltz of the Congress of Vienna? Who knows? Photos, diaries and cartoons sure suggest more was going on than met the dance master's eye. The word "groping" reminds me, that contemporary sources said that was why the Strauss waltzes had those long, languid intros. Couples stood around gazing and nuzzling until the beat got going. Richard Powers said whenever the dance manuals say "it is never done" you can be sure a lot of people were doing it; the dance masters just did not approve. What a great topic! Thank you, Walter! Submitted by Unregistered on Wed, 06/09/2010 - 5:04am. I think your analysis of the Regency waltz on this and other pages here is a little bit incomplete and depends on some assumptions that are not necessarily accurate. Single-sourcing reconstructions is dangerous! - The slow waltz being done hip-to-hip is far from a definitive or universally accepted reconstruction, and if you look at near-contemporary (1822-1823) English and French sources, or even look more carefully at Wilson and Byron, I think that the preponderance of evidence is against hip-to-hip being correct. - The sauteuse has a leap, not a hop, and is quite lively, reminiscent of the redowa. It also usually includes a change in time signature: most surviving sauteuses are in 2/4 or 6/8 time, with music more like an oddly-accented polka. Very few are in 3/4 or 3/8. - The jette is likewise done in 2/4 or 6/8 time and is essentially rapid schottische-like leap-hop pivots with a kick added. It's more terrifying than romantic, though it often does make you laugh for joy when you make it work. It really gets the blood pumping. And transitioning from it directly into the slow waltz is quite difficult. - Many of the pictures you are using to illustrate different positions are caricatures, and French ones at that. Caricatures are intended to exaggerate rather than be accurate and should be used with caution. We can discuss more at Stanford, if you like.